It turns out I was right in being quite impressed with the severity of the tornado setup yesterday in Illinois. 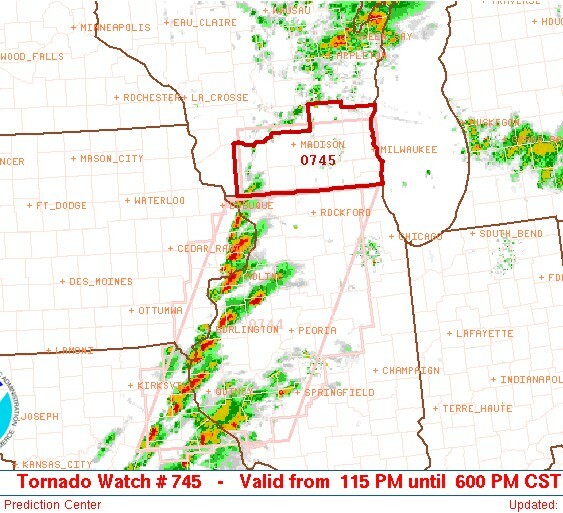 There were a total of eight tornado reports from northern Illinois into southern Wisconsin. Three people were injured when a reported half mile wide tornado passed near Loves Park, Illinois. Click on the YouTube video below to see the tornado at a different stage in its life as it passed by Loves Park. The Loves Park, Illinois tornado was produced by a low topped supercell. An unusually high amount of CAPE was available for this setup as RUC estimates were in the 500-1000 J/KG range around the time when the tornado occurred. Low level shear was very high, so it’s not surprising that a sizeable and possibly violent tornado occurred (the tornado has not been rated as far as I know). I will say this — the tornado bears a striking resemblance to the Gilbert, Iowa tornado I chased back on November 12, 2005 (see videos below). And I’m not just bringing it up to toot my own horn! Both tornadoes were short stovepipes with that violent wavy motion on the sides. They were both ‘short’ because the surface temperature was not very warm (lower 70s), but the dewpoints were in the lower 60s! So the cloud base on both days were quite low, and the reason why both tornadoes were so stubby. And both tornadoes were produced in November from low topped supercells that formed under high shear yet unusually high amounts of CAPE, given that type of setup. The big difference between the two events, however, is the Loves Park, Illinois tornado formed from a storm that develop ahead of an arctic cold front. I will also say the Loves Park tornado visually LOOKS stronger than the Gilbert Iowa tornado. Whether or not that means a higher rating — I just don’t know. A damage survey will provide us with that answer. Below are two clips of the Gilbert, Iowa tornado for an interesting comparison between it and the Loves Park tornado. 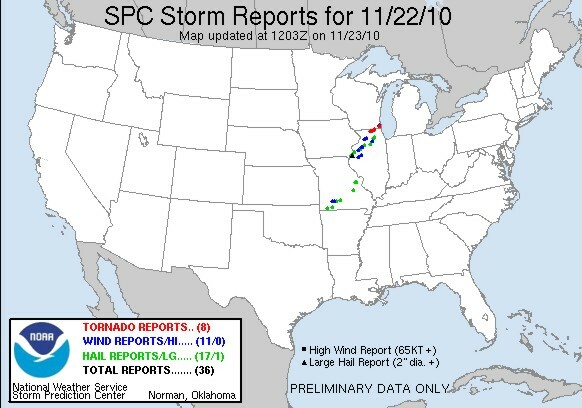 Both tornadoes were produced from low topped supercells in neighboring states in November under similar conditions. I’d love to see additional video of yesterday’s tornado in Loves Park, Illinois. But based only on John’s video shot from what appears to be at least two or three miles away, I can’t imagine that tornado being rated lower than EF2. So once again, 2010 brings yet another photogenic tornado! Wow, a half mile tornado was spotted at 3pm in northern Illlinois! See the spotter report below. Discrete, low topped supercells have developed across extreme eastern Iowa and northeastern Missouri and are rapidly moving into northwestern Illinois. Dewpoints in the lower 60s have resulted in RUC estimated Cape values of 500-1000 J/KG. Backed 925mb flow beneath 50 knot 850mb winds out of the southwest are creating an excellent low level shear environment for tornadoes. This is certainly turning out to be quite the setup for low topped supercell capable of producing tornadoes over the next few hours across northwestern Illinois and eventually stretching into southern Wisconsin. I’m honestly quite impressed with this setup right now, especially considering the strength of the arctic front only one state to the west! 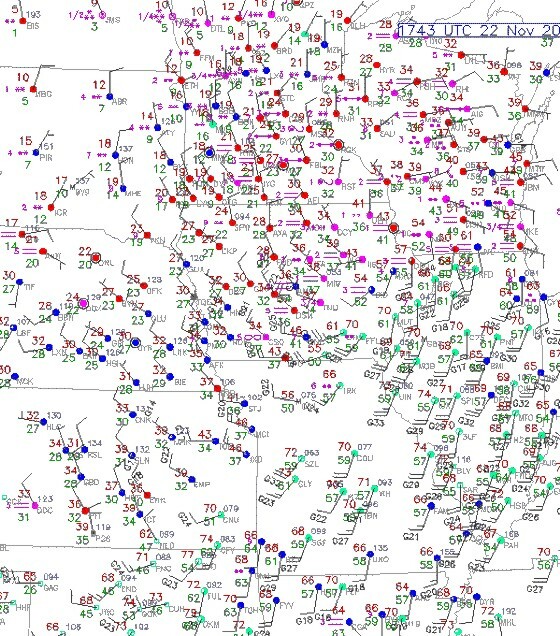 Surface map at 12:43 pm EST November 22, 2010. An arctic front is making its way through the Great Plains today. Temperatures in the Dakotas are in the teens and single digits, with temperatures in the 20s and 30s in Nebraska, Kansas and Iowa. But if you go a bit further south and east over Missouri and Illinois, temperatures are well into the 60s and 70s. Dewpoints are even well into the 50s, with some scattered lower 60s dewpoints in northwestern Illinois. From the satellite image above, you can see the tops to thunderstorms that have already developed along and just ahead of the arctic front from central and northern Missouri into eastern Iowa. Strong 0-6km speed shear is present, given a 80 knot 500mb jet. Moderate low and mid level shear is present as a result of very fast northeast storm motion and 50 knot 850mb winds out of the southwest, which are forecast to back to the south-southwest later this afternoon. The cold 500mb temperatures coupled with increasing low-level moisture has brought sufficient CAPE values to support low topped supercells capable of producing large hail and tornadoes across northern/northeastern Missouri into western Illinois. Unfortunately, these storms will be moving way too fast for anyone to effectively chase them. That is unless a chaser simply puts him or herself in the path of one of these storms and gets lucky enough to see a tornado as it passes by at 60 mph!! I apologize for the lack of posts over the past couple weeks. Things are slow on the weather front and there aren’t a whole lot of interesting things to talk about. The primary focus of this blog is storm chasing/tornado setups, and severe or extreme weather. Once the rather extended storm chasing season ended sometime in August, the Atlantic hurricane season came to the rescue with more storms to track, and more topics to discuss. As time moved on there were a couple storm chasing setups in the Fall. But as of late, things have been quiet. So, let’s switch gears and talk about something else. It looks like the first true taste of winter temperatures will be arriving late next week (November 18/19) across the Rockies, Plains and then into the Midwest. Arctic air is expected to move south from Alaska and build across western Canada, then dive south and east across the Rockies, Plains, then modifying somewhat as it reaches the Midwest. The air will modify even further as it reaches the East coast, but it’ll still be the biggest chill of the season thus far. This cold outbreak should bring some decent snow to Colorado and the first taste of winter temperatures to the northern Plains. This cold pattern is going to put a damper on any chances for storm chasing setups over the next couple weeks. Of course, there may be a squall line setup or two; one from a shortwave before the arctic air arrives, and one just ahead of the arctic front itself next week. But these setups are not usually known for producing tornadoes. Don’t worry, the muscles of La Nina should return for a period either at the end of November, or sometime in December. That should bring back the raging Pacific jet stream and prompt a ridge back over the South and East. With enough Pacific energy and a little luck, we still may see another opportunity for supercells and tornadoes across the southern Plains or deep South before the 2010 is over.